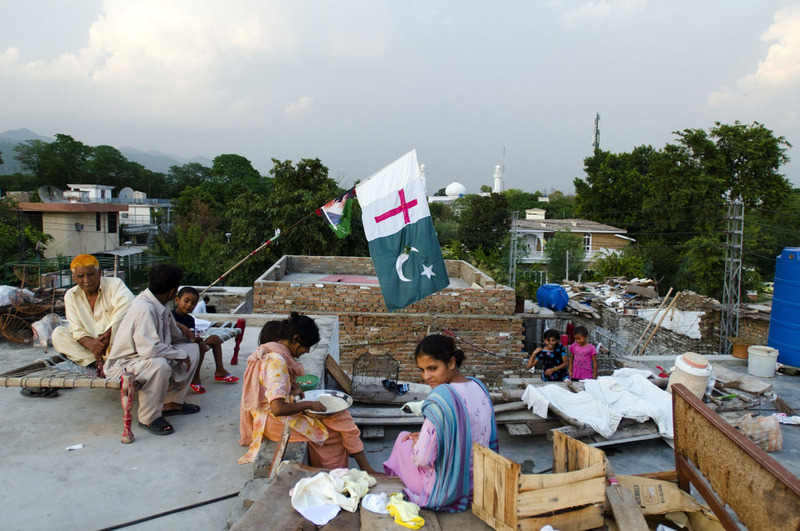 Christian Pakistani family sitting on their roof in front of a Pakistani Christian flag inside the France Christian Colony in F7/4 Islamabad, Pakistan on August 19, 2008. Christians make up only 1.5% of the population of Pakistan, a country which is 97% Muslim. Christians living in Pakistan face serious problems, including unequal employment and education opportunities, and poor housing facilities. Many are scared go by their Christian names or to wear physical symbols of their faith in fear that they will be charged with blashemy for defaming Islam.